How to get there: This mountain is normally climbed from the DNT hut Glitterheim or from Spiterstulen. A traverse of the peak hiking between these two huts is quite common. Route description: The trail from Glitterheim is well marked. The trail is mainly among the rocks and boulders, partly towards the end on snow. The final approach climbs the huge snowbank that forms the summit, be aware of overhanging snow towards the vertical east face of the mountain. 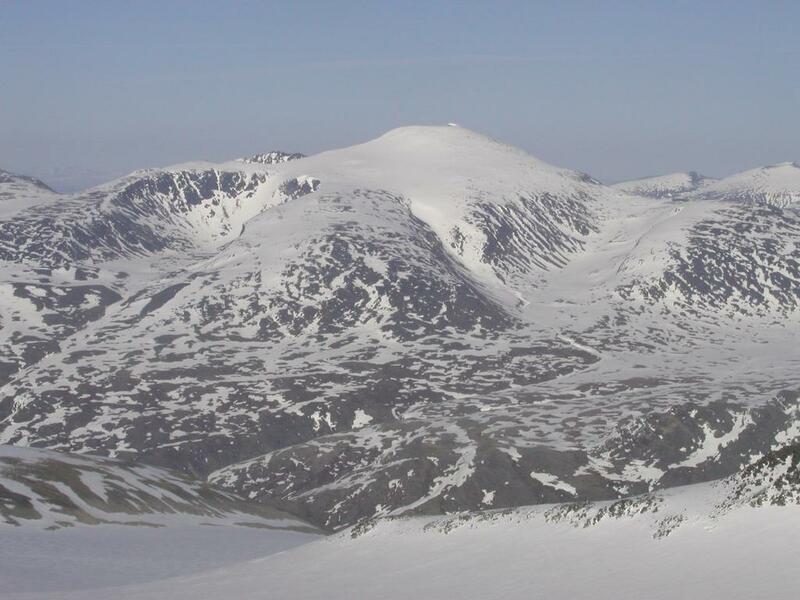 Comments: This mountain has had a higher elevation than Galdhøpiggen in the past (2472 m), but since this includes the huge snowbank which varies in height from year to year it is regarded as Norway's second highest peak. In recent years the snowbank has been about 5 m lower than Galdhøpiggen. The highest rock of Glittertind reaches 2452 m.
Glittertind as seen from Vesle Galdhøpiggen (2369m), May 18th. 2002.